Cost-cutting measures by local councils that redefine which potholes get fixed will plunge Britain yet further into its pothole crisis, according to Warranty Direct. The Company, which set up www.Potholes.co.uk to campaign for better road maintenance, says that even fewer of the thousands of craters that blight the UK's highways will be repaired if new guidelines pioneered by Lambeth Council are adopted by other authorities. Under the new guidelines set by Lambeth Council, in South London, holes that are as deep as 1.57 inches (40mm) will no longer be repaired. Previously, holes measuring more than 0.98in (25mm) were filled in. Three quarters of local authorities are set to follow this trend. As parliamentary research shows that the total cost to repair every pothole in the UK has soared to more than £13bn, Warranty Direct warns that the national repair bill of £1bn for motorists to fix car damage done by potholes, mostly on smaller local and residential roads, will also rocket. 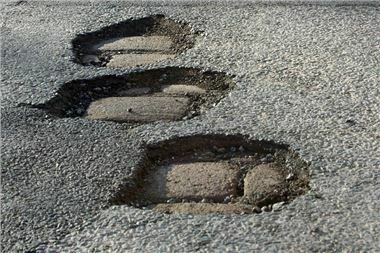 Duncan McClure Fisher, managing director of Warranty Direct, commented: "Much of the estimated £13bn is attributable to a decade of completely inadequate patch and mend repairs and nonexistent control over the numerous contractors who dig up the roads without a second thought. "Councils must consider engaging local businesses much more in order to make real progress. "This is another kick in the teeth for motorists who already pay an average of £335 a time to repair pothole-induced damage to their cars. It also undermines calls for a long-term strategic plan to manage the crisis so once again it's the British motorist who will pay the price." www.Potholes.co.uk and www.fixmystreet.co.uk run alongside each other as a means of notifying potholes, and if they are not rerpaired the notification serves as a matter of record for malfeasance claims against councils.